U.S. interceptor missiles planned for deployment in Poland could trigger a retaliatory strike from Russia if they are ever used, Army Chief of Staff Yuri Baluevsky said following "disappointing'' talks with the Americans. Russia will consider measures "to protect security,'' while it continues a dialogue with the U.S. following "disappointing'' Dec. 13 talks in Budapest, Deputy Foreign Minister Sergei Kislyak said at a press conference broadcast on state-run television station Vesti-24. The U.S. plans to station the 10 interceptors in Poland and a radar base in the Czech Republic as part of a missile defense program. Russia offered the use of a Soviet-era radar base in Azerbaijan and a new facility in southern Russia as a compromise. Russia has expressed concern that the Czech base would allow the U.S. to spy on most of the country. Any new security measures will be "adequate and asymmetric,'' Baluevsky said without elaborating. The U.S. is still seeking ``direct confrontation with Russia,'' he said. Russia described the U.S. plan as a threat to its security and dismissed arguments that the missile shield is needed to counter the threat of an airborne attack from so-called rogue states such as Iran and North Korea. If used, the missiles in Poland could be mistaken for a ballistic missile aimed at Russia, which would then trigger a retaliatory strike from Russia's automated system, he said. The USA decided not to cut its military presence in Europe, Austria’s Die Presse wrote yesterday. U.S. troops were heavily deployed in the Old World during the opposition between the United States and the Soviet Union. When the Cold War ended, the Pentagon started to evacuate the troops from Europe. The U.S. administration planned to keep the deployment of only 24,000 servicemen by the end of 2008 as opposed to 43,000 military men currently serving in Europe. However, Washington apparently changed its mind against the background of Russia’s rising powers. General David McKiernan said that the U.S. troops would stay on their European bases, because the Russian power started rising, the Austrian newspaper wrote. “If this is a reaction to Russia’s decision to suspend its participation in the Conventional Armed Forces in Europe Treaty then it is a weak and a nonsensical statement to make. It reminds a person in a state of hysterics, not knowing what to say and how to react to something. The U.S. administration basically ignored our suggestions regarding the missile defense system. Now they start to rattle their weapons near our borders again. What’s next – another Cold War? This is a matter of the past, and no one wants to go back there again,” the Vice President of Russia’s Military Expert Board said in an interview with the Komsomolskaya Pravda newspaper. The USA has about 730 military installations all over the world outside its territory controlled by the Pentagon. The US has nearly 1.4 million active personnel, and over 369,000 of those are deployed outside the United States and its territories. In the meantime, The Party of European Left (EL) opposed the extension of the missile defense and U.S. military bases in Europe, EL's newly elected chairman Lothar Bisky said at the close of the EL three-day congress in Prague on Saturday. "Europe needs neither an anti-missile shield nor an armament agency. This would only provoke further armament. Europe needs culture of peace," said Bisky, viewed as a politician who unified two left-wing parties in Germany, with voter preferences of up to 30 percent in some of the East German regions. His speech came as an reaction to Prague and Warsaw's ongoing negotiations with Washington about the possible building of a U.S. radar installation and a base with interceptor missiles on Czech and Polish soil, respectively, Xinhua.net reports. The EL was established in Rome in 2004. It associated 29 European left-wing and communist parties from Austria, Belgium, the Czech Republic, Estonia, Greece, Hungary, Luxembourg, Portugal, Romania, Spain, Switzerland and other countries, most of which stand to the left of social democrats on the political scene. A pro-Kremlin youth movement said it will distribute fliers accusing the United States of planning to incite "thieves and traitors" to rebel across Russia - a move that reflects an increasing strain in Moscow's relations with Washington. Organizers for the group, called Nashi, said Sunday it is mobilizing against an alleged threat of a Western-inspired revolt following Sunday's parliamentary victory by President Vladimir Putin's party. United Russia won a solid victory in the election, cast as a referendum on whether Putin should remain Russia's de facto leader after he leaves the presidency in May. 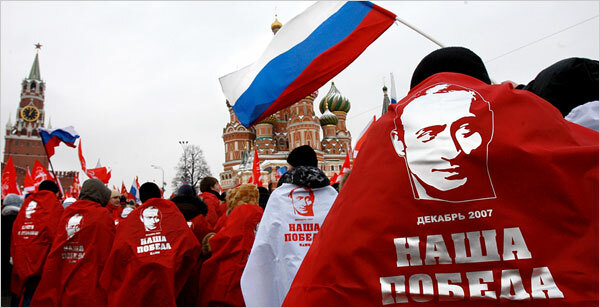 The leaflets, copies of which appeared on several Web sites before the vote, seem aimed at rallying Nashi activists in case anti-government protests break out in the wake of the elections, which opposition leaders charge were marked by state-sponsored coercion and intimidation on behalf of United Russia. Kristina Potupchik, a spokeswoman for Nashi, which means "Ours," said the group will start distributing the leaflets Monday. One side of the leaflet praises Putin's victory in the election, while the other accuses the U.S. of enlisting critics of Putin to try to overturn the results of the vote. A cartoon depicts Uncle Sam sitting on sacks of money with names of Russian opposition leaders written on them. "They wanted traitors and thieves to win," the text says. "Between Dec. 3 and 6, before the official announcement of the election's result, (the traitors) will try to seize squares and buildings, provoke disorder, take our victory from us." A U.S. Embassy spokeswoman called the claim "ridiculous." The Nashi move follows Putin's allegations that Washington sought to discredit the vote by pushing the Organization for Security and Cooperation in Europe not to send observers to monitor the election - the claim denied by both Washington and the OSCE. Putin also denounced Russia's liberal opposition as "foreign-fed jackals." Gordon Johndroe, spokesman for the U.S. National Security Council, on Sunday criticized the election, saying it was marked by state interference on behalf of United Russia and intimidation of the opposition. A half-dozen pro-Putin youth groups have sprung up in recent years, drawing thousands of members. Many have been organized and funded by the Kremlin and its business allies, concerned about the role that youth groups played in mass demonstrations in Ukraine and Georgia that helped bring pro-Western governments to power. Many pro-Kremlin youth groups claim to oppose political extremism, but some of them preach nationalist, anti-democratic and xenophobic sentiments. Opposition leaders, including former world chess champion Garry Kasparov, have repeatedly been harassed by pro-Kremlin youth in the run-up to Sunday's vote, with activists stalking leaders, disrupting press conferences and playing recordings of loud, maniacal laughter at protests. Kasparov said one pro-Kremlin youth handcuffed himself to Kasparov's car three times. Boris Nemtsov, a leader of the liberal Union of Right Forces party, said recently that a 19-year-old Nashi activist tried to put a butterfly net with a sign saying "political insect" on his head, while others have pelted him with condoms. Nemtsov told The Associated Press that he punched the 19-year-old with the net. In the run-up to Sunday's election, Nashi created its own network of election monitors, Nashi Vybory. Pyotr Korolev, deputy head of the group, said it dispatched 20,000 activists to conduct exit polls throughout the country. This effort, he said, helped draw attention to the election and increase turnout. "But we do it by conducting an unbiased sociological survey," Korolev said.